According to tradition, the establishment of the sanctuary goes back to the time of mythical Deucalion. The site was inhabited in the prehistoric period and the cult of Zeus is attested in early historic times. In ca. 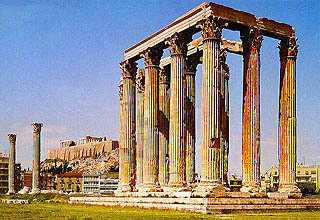 515 B.C., Peisistratos the Younger, began the construction of a monumental temple which was not finished because of the fall of the tyranny in Athens. Much later, in 174 B.C., Antiochos IV Epiphanes, the king of Syria, attempted to continue the erection of the temple, which was finally completed by the Roman emperor Hadrian, in A.D. 124/125. Inside the temple stood a colossal chryselephantine (gold and ivory) statue of Zeus. The temple was excavated in 1889-86 by E. Penrose, and in 1922 by G. Welter. The Greek Archaeological Society conducted excavations in the area around the temple, between 1886 and 1907, and work was resumed by Ioannes Travlos in the 1960's. Many parts of the circuit wall of the sanctuary have been rebuilt, imitating the ancient masonry. Sections of the ancient wall have been preserved only at the south-east corner and on the north side.